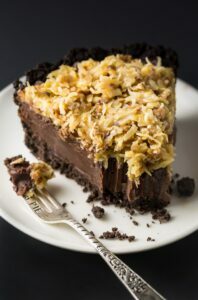 An easy and indulgent No-Bake German Chocolate Pie Recipe! 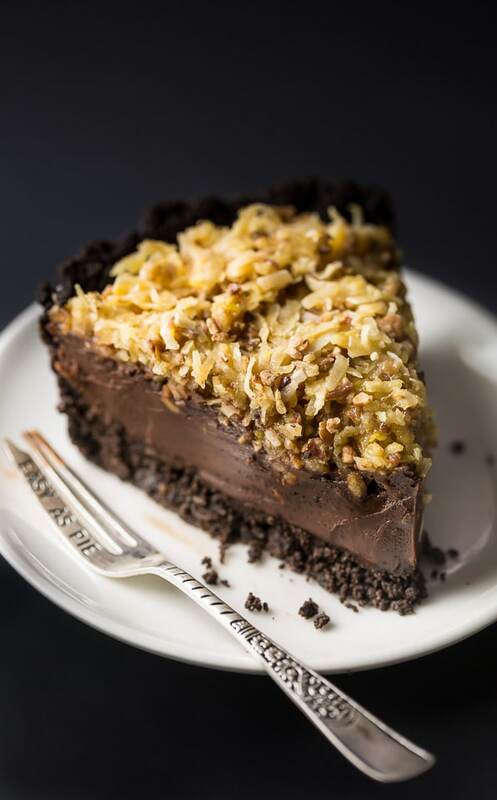 Featuring a chocolate cookie crust, decadent chocolate filling, and coconut pecan topping, this sinfully sweet pie is always a hit! Perfect for those days it’s too hot to bake! 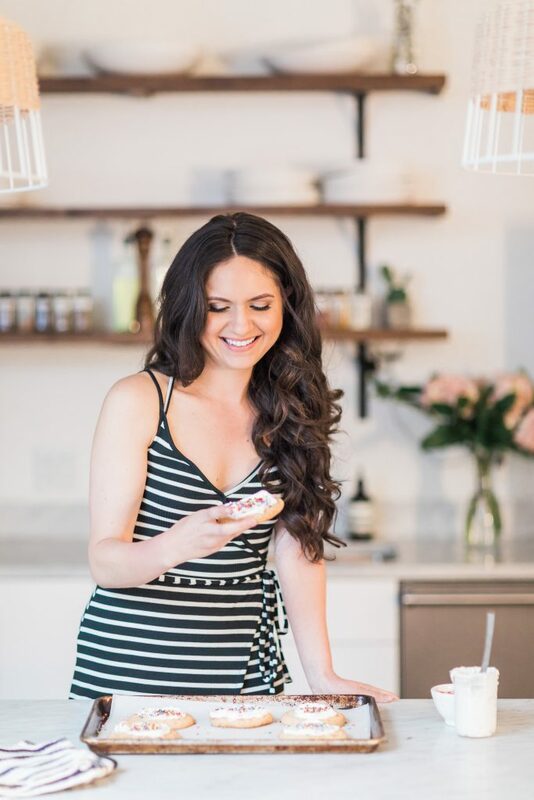 Last week I asked you all on Instagram what kinds of recipes you wanted to see more of this Summer and the response for no-bake desserts was (delightfully) overwhelming! You told me you wanted easy recipes, too. And of course, more chocolate recipes couldn’t hurt. Your responses were music to my ears! Thank you, thank you. And to thank you even more, here’s a slice of easy, chocolatey, no-bake German chocolate pie! Because this pie is mainly made up of chocolate, I strongly suggest using a quality brand you know melts well and tastes good. I love Lindt 70% cocoa bars for this recipe because they’re not too sweet, melt great and tastes amazing. But whatever brand you choose, just be sure you’re using real chocolate bars and not chocolate chips. The crust of this pie is made from crushed Oreo cookies and melted butter. You do NOT need to remove the filling from the Oreo cookies before crushing them up. When it comes to crushing up your Oreo cookies, you have options. 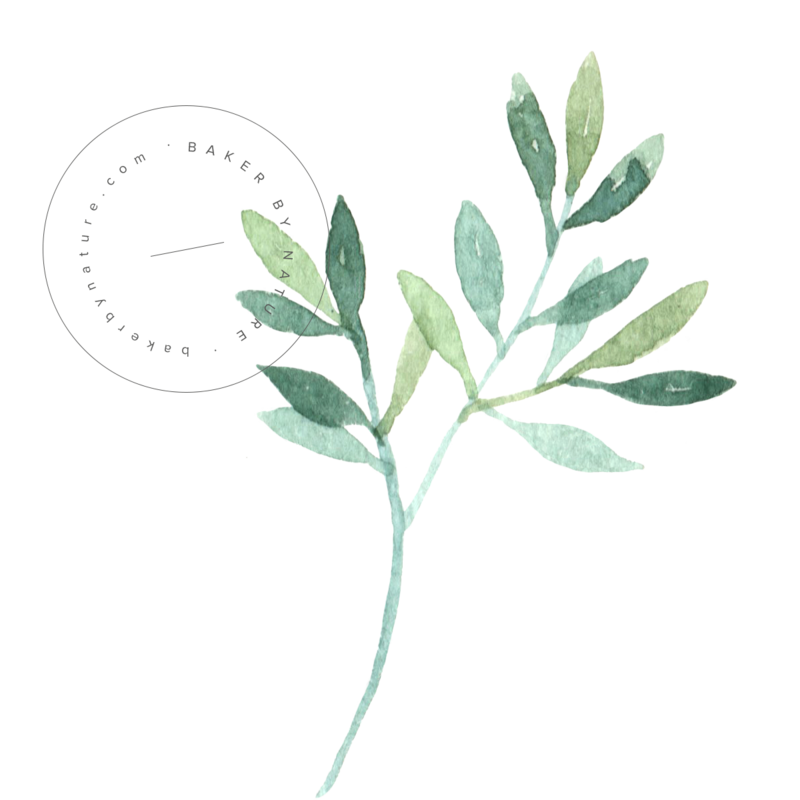 If you own a food processor or high-powered blender, you may simply place the cookies in the body of the machine and pulse until they’re in fine crumbs. You may also crush them manually, by placing the cookies in a large ziplock bag, and rolling over them with a rolling pin or wine bottle. Just make sure all of the cookie bits have been finely crushed, as large chunks will cause the crust to break more easily. Freezing the crust before you add the filling is a crucial step that should not be skipped. I find 30 minutes the perfect amount of time, but you can cover the crust and freeze it up to 1 month in advance! When heating the cream for the chocolate ganache, be sure to bring it to a low simmer, not a full boil! Once it begins simmering, remove it from heat and pour it over your chopped chocolate. Bringing the cream to a simmer should take less than 2 minutes, but all stove tops work a little differently, so keep an eye on it. If you have a nut allergy, this pie can be made without the pecans. Simply leave them out! 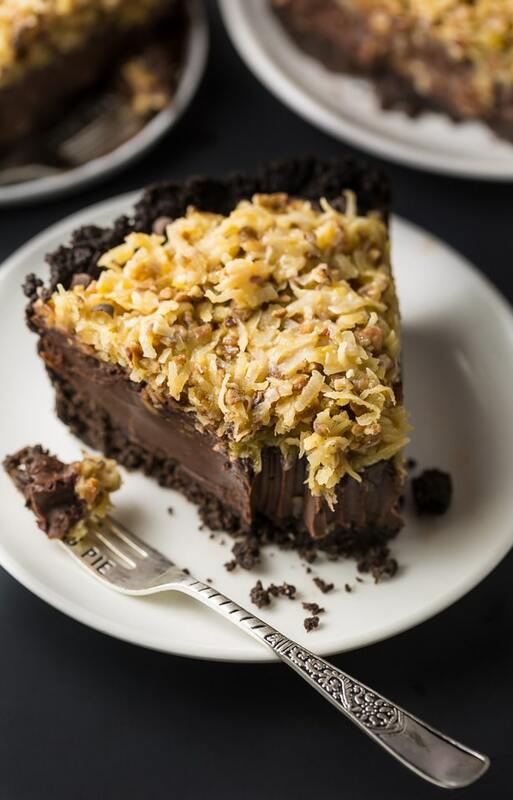 If you plan on serving this no-bake German chocolate pie asap, place it in the freezer for an hour before slicing. If you’re making this pie ahead of time, it may be covered and stored in the fridge for up to 3 days, or in the freezer for up to 2 months. Don’t worry if the crust crumbles a little when you slice it! This is normal – especially for no-bake pies. However, cleaner slices can be made by being sure you’ve cut the through the crust before lifting the pie slice up and out of the pan. I do this by running my knife back and forth a few times before removing it. Crunchy… creamy… and chocolatey, this pie has it all! Since it’s super rich, I suggest slicing the pieces small and serving them with plenty of napkins 😉 Enjoy! 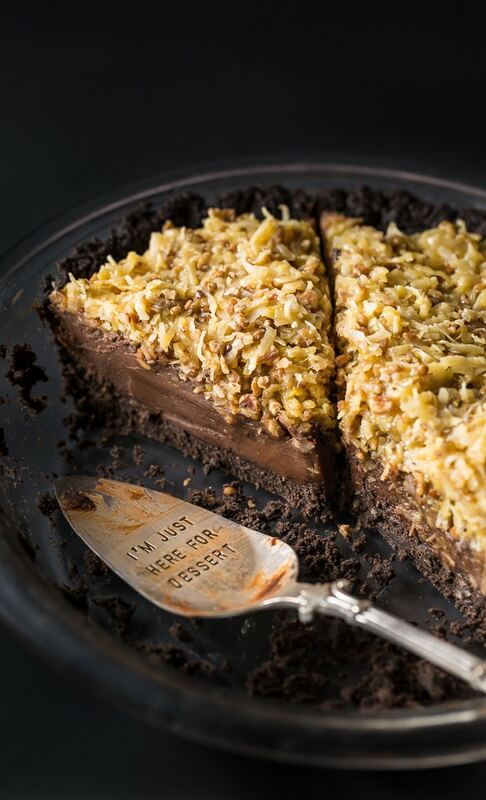 An easy and indulgent recipe for No-Bake German Chocolate Pie. In a large bowl combine Oreo cookie crumbs and melted butter, mix well to combine. Press the crust into a 9" pie plate, pressing it in the middle and up the sides. Place crust in the freezer for 30 minutes. Add chopped chocolate to a large heatproof bowl; set aside. In a small saucepan over medium-heat, bring the cream to a low simmer then remove from hear. Pour the warm cream on top of the chopped chocolate and set aside for 1 minute. Using a whisk, stir the chocolate and cream together, whisking until the the melted chocolate and cream are completely combined; about 2 minutes. Add in the butter and use a spatula to stir until the butter is completely melted. Pour into chilled crust and set aside. In a small heavy saucepan, combine brown sugar, half and half and butter. Bring to a boil over medium heat, whisking constantly to dissolve sugar. Remove from heat. Place egg yolks in a small bowl, whisk a small amount of hot cream mixture into the yolks to temper the mixture, then return everything to the pan, whisking constantly. Cook 2-3 minutes over medium heat, stirring constantly; the mixture will thicken during this time. Remove from heat. Stir in coconut and vanilla; cool 15 minutes. Pour mixture over chocolate filling and sprinkle with pecans. Refrigerate for at least 2 hours before cutting into slices and serving. cream that has around 10% fat. This is truly amazing! Tastes like a dream come true! Everyone needs to make this! Since walnuts, almonds, and pecans are all different nuts I can only imagine they would taste different. Seems obvious. Same question as Daniella? How many actual Oreos are used to make the oreo crust? I believe it’s usually 32 oreo’s. Hi would like to know if it’s ok to use bittersweet chocolate? Thanks for sharing! I made this and it was amazing. Hi.. Can i leave the shredded coconut without changing the taste? Or can i substitute it with other ingredients? I would recommend taking out of refrigerator at least 2 hours before serving. If not it’s like cutting through a rock! Very tasty though. where did you get your cute silverware?